Helge and Kina volunteered in Senegal in November 2012 and were some of the first individuals at the placement. The Senegalese Microfinance Project involves loans being distributed to young street boys (known as Talibés) who work with Projects Abroad to acquire necessary business acumen, generate business ideas and then start and grow their own businesses to the point where they earn enough profit to pay back the loan. This model has proved extremely successful and Projects Abroad has been instrumental in funding 40 businesses in the last two years. Following on from this, Helge and Kina have used their experience in Senegal to help establish a similar project in Cambodia, in partnership with Khemara. Khemara is a respected NGO involved in a variety of activities, including running ten childcare centers, assisting families impacted by HIV Aids, providing education for women and enforcing programs which deal with child protection and justice. Projects Abroad and Khemara have a long-standing relationship which has benefitted multiple local Cambodian communities. The Microfinance Project will be a further extension of this positive relationship between the two organizations. Khemara already has a list of potential beneficiaries in place whose lives could be changed dramatically by the opportunity to build their own sustainable businesses. In order for the project to be a success, however, volunteers must first be recruited to work alongside local staff to teach prospective business owners basic accounting and company development skills. If you have some business or management skills and are interested in getting involved we’d love to hear from you. 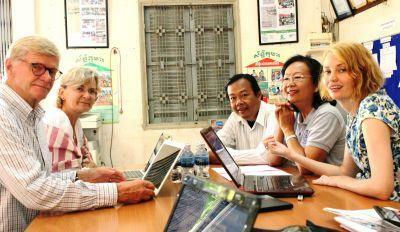 Learn more about the Micro-finance Project in Cambodia here.